Nowadays, free Bootstrap templates are all over the internet. But all of them are not good in quality. It is really a hassle to find the perfect template for your next project from the ocean of the internet. So, keeping this in mind, we are providing 30 free bootstrap website templates which are of very high quality in their respective categories. In today’s world, Bootstrap is the king of CSS frameworks. Nearly all the modern websites and web templates are made with Bootstrap because of its vast amount of features and functionalities. Websites made with bootstrap are fast, responsive and stylish. Apart from that, since bootstrap was introduced in 2011, it is now pretty mature and stable. In this article, we have listed free bootstrap themes mostly made of bootstrap 3 along with few bootstrap 4 templates. Since all the templates enlisted here are free, you have the flexibility to choose which fits you best. It is also a great opportunity to familiarize yourself with the Bootstrap framework and how a website is built. In this article, there are templates for business, restaurant, portfolio, admin dashboard, corporate, creative agency, education, app landing, etc. So, No matter the type of industry you are in, these templates handle them all with ease. From here the awesome list of free Bootstrap templates starts. Go through the full collection to find the real gem. The post ranges through various categories so that everyone can get a template for their need. ThemeWaon has introduced a quality checked category where you will find only world’s most tailored and polished premium templates. The number of multipurpose templates is usually limited and not all templates are worth to fulfill user expectation. Multipurpose templates hold varieties of potential features so that one template can cover multiple categories like blog, business and agency, e-commerce, photography, landing page, portfolio and so on. 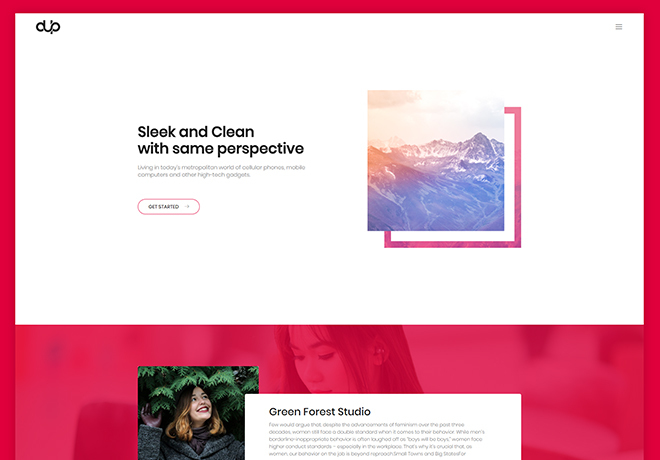 Here we have enlisted Titan which is honestly a marvelous multipurpose template in one word and you can create any types of the website with it smoothly. You can easily customize the whole template to turn your desired website from less appealing to marvelous. If you are still thinking about its quality, then we are assuring you about it. And Titan is equipped with coolest features ever like responsive drop-down navigation, masonry, blog layout etc. It comes up with structural documentation and SCSS files. You won’t get such a useful multipurpose free bootstrap website template. Need a professional multi-page portfolio template for the site? Nitro is a champ in its category having all the fabulous features and modern design! Its exemplary side navigation bar will amaze every visitor. It has separate pages for Home, Contact, About etc., And you have the full control to customize your site according to your need. Every single page is accompanied with beautiful scroll effects. Moreover, you get Google Maps, animated counter, parallax background that will attract more customers. Made with the minified version of Bootstrap, Nitro is fast, accurate and fully responsive free Bootstrap template. So, what are you waiting for! Get it now. 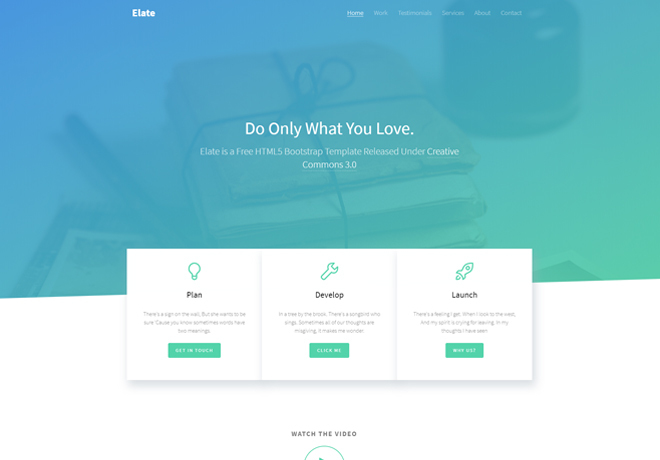 Elate is a multi-purpose free bootstrap template with loads of cool features. It has an attractive and modern design, the gradient color combination gives it an amazing look. Apart from that, you get 4 built-in gradient color schemes! It is lightweight, animated and fully responsive. No matter whether you’re viewing from a 27” iMac or a tiny smartphone, Elate will run smoothly. Elate is equipped with catchy hover effects throughout the page, starting from the sticky navigation bar to the social media buttons on the footer. You can add Video, Portfolio, Testimonials, Services and what not! This theme is fit for personal or agency portfolio, be it a software firm, business agency or medical firm, Elate will never disappoint you. 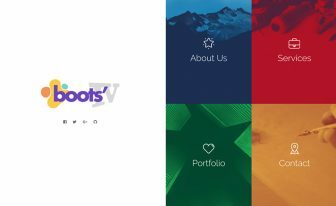 A game changer from free Bootstrap templates. An exceptionally beautiful free Bootstrap templates can increase customers, boost sales and expand the popularity of your business. 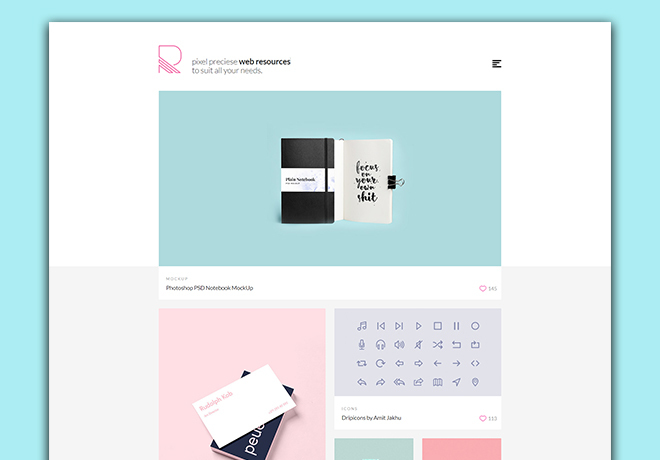 Pato is such kind of web template, it is all the way adorable from top to bottom. This template is made for restaurant websites, no matter whether you have a small cafe or a commercial restaurant chain, you can always decorate your website with Pato. Built with latest bootstrap 4, Pato has a plethora of features and effects. The cool animated preloader, transparent sticky navigation bar, full background slider, masonry gallery, hover effects will definitely amaze every visitor. The drawer menu on the right side is noteworthy. 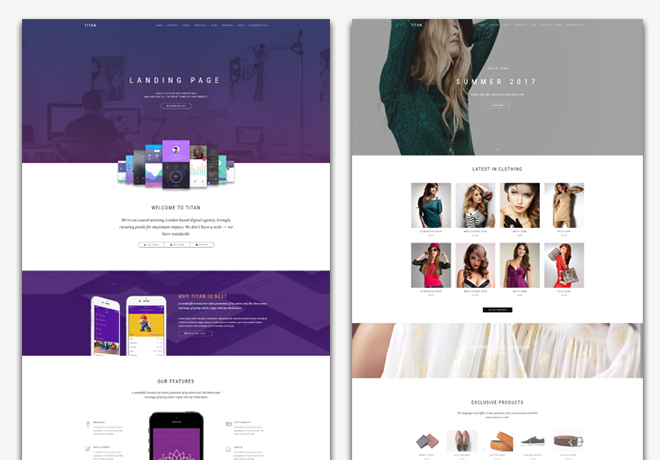 Pato is a multi-page template with 8 different pages. Apart from that, it has table reservation form, restaurant menu, gallery, and blog. One thing more, since built with bootstrap, Pato is definitely responsive. 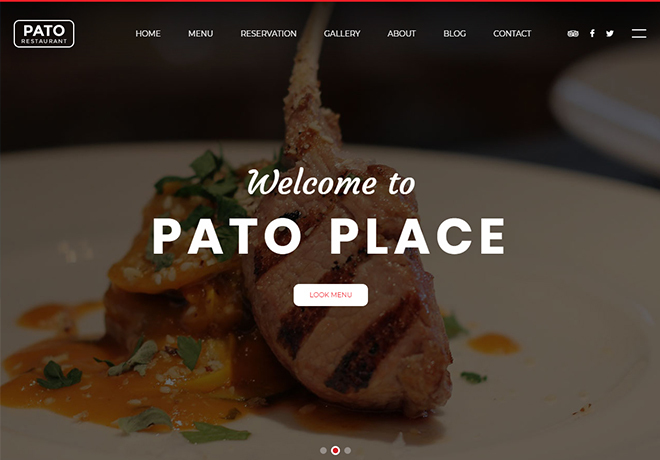 If you are a restaurant owner or a web developer, you will find Pato amazingly handy for you. 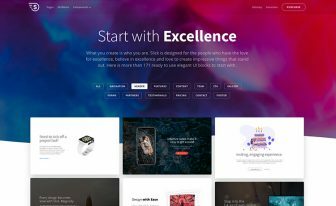 A perfect multi-purpose website template, Megakit is one of the best free bootstrap templates out there. Let’s talk about its Layouts first. It has 6 different home styles (or layout) – Corporate, App landing, Events, Lawyer, Clinic, and Coming Soon. Every Layout has their own suitable color scheme, which is a smart move. If we talk about the design, you’ll find very few templates with such amazing design. The full-screen dark burger menu is exemplary. You can find this kind of features in premium themes like Posh. Full-screen image background along with an animated slider and video playback button welcomes you. Megakit is equipped with other notable features such as vector icons, parallax, modal video playback, masonry gallery, animated counter, Google Maps and much more. Moreover, Megakit has well documented and organized code. So, no matter what kind of website you need, you’ll feel at home with Megakit. There are very few free Bootstrap 4 portfolio templates out there. Profile is one of the best of it’s kind. It is even comparable to the premium templates because of its quality. A perfect portfolio website needs to be simple but classy, Profile is no exception. Its minimalistic yet eye-catchy design will attract every prospective client. 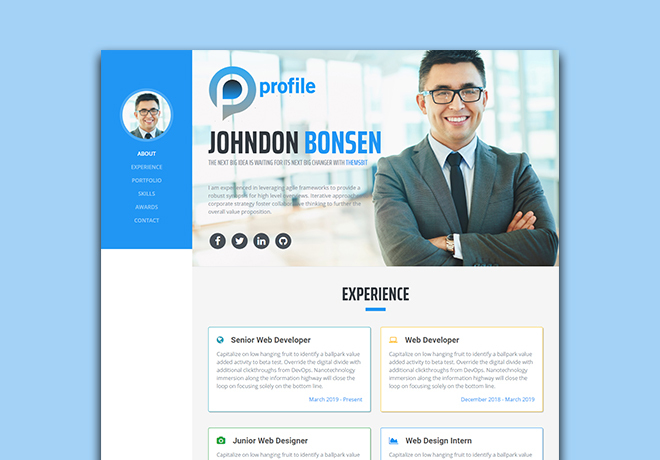 The user interface undoubtedly looks splendid and makes Profile one of the best free Bootstrap templates. On the left, there is a static sidebar, and on the first section, you can add a large photo of yours. On the next parts one by one, you can display your experience, portfolio, skills, awards systematically. The following sections contain a contact form. Also, Google maps integration will help you big time. So you see, it is the one which is worthy of your portfolio template. 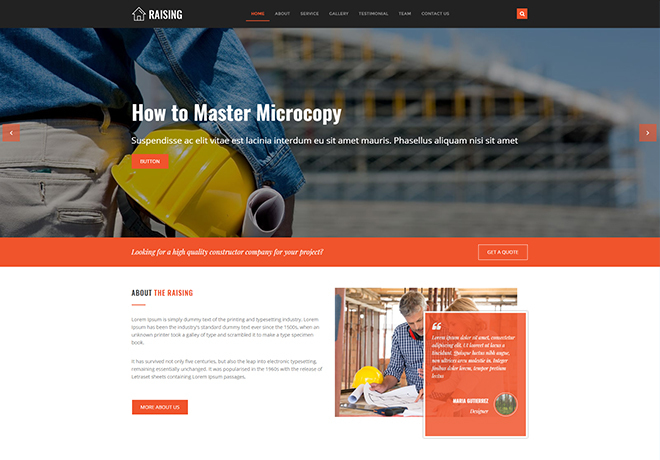 Looking for free Bootstrap templates for under construction web pages? Count is a modern, eye-catching and creative free coming soon website template. It is built with attention to detail and has a splendid design. Count is available in three style variants: static, slideshow and animated particle background. Every style is sleek in their own ways. Its professional and modern design, awesome color combination, cool animations and its great typography makes it an ideal template for agencies, startup businesses, portfolios, and other creative and innovative professionals. Count is fully responsive and retina ready, it will look great and sharp no matter what device it is being viewed on. You’ll rarely find a free website template having all the features in the web! 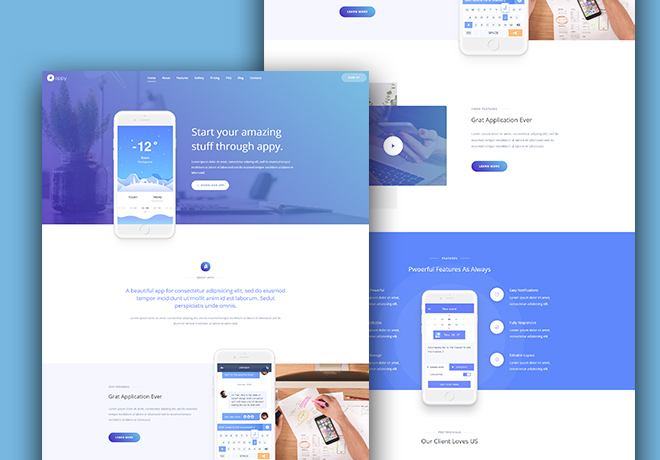 MobiApp is a spectacular landing page template, and it is a clean and simple one. 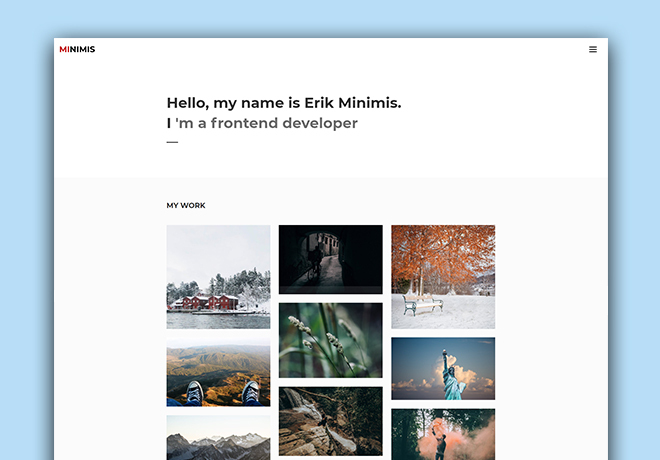 Simple and clean templates are always highly demanding among developers, so this one-page template can be that. Whether your application is free or paid it must look elegant, so MobiApp will fulfill these criteria without any cost. Make your website more wow as well as amazing and MobiApp is ready for this purpose. It is an HTML5 template energized with the power of bootstrap 4 tools. Owl Carousel, slider gallery, navigation bar, ghost button, social media icons, on-scrolling animations, accordions and many other features are included. Device mockup, Google web fonts, CSS3 animations are also there to enrich the template. What else you need in a landing page template, it’s more than your expectation. So you can choose MobiApp for your website or application without thinking twice. Recently wedding and event management is most talked and challenging alternate career option. One must be creative to choose this path. So if you are going to start wedding and event management company or already have one, then you should think about making online space as this is the era of the internet. 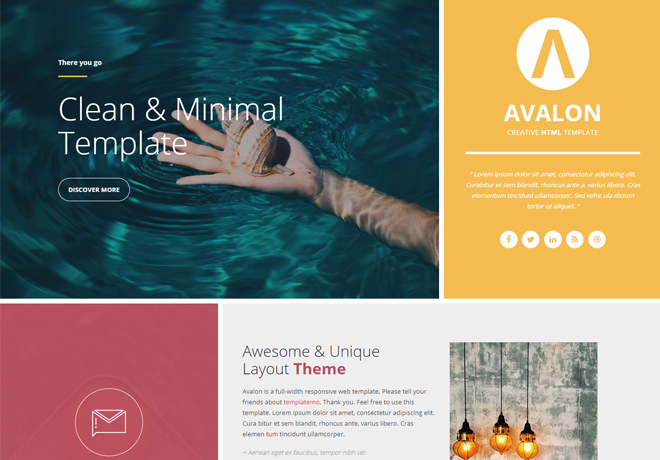 To provide you with the most helpful tool, we are here with Avalon template. Download this template and build your website so that people may get to know about your company and business precisely. You can detail your creative ideas, offers, special packages, venues in this website to get clients attention. Avalon has such nice and cool features like carousel slider, font awesome icons, datepicker option, masonry blocks, on-hover animations, contact form, filterable event listing and many others. You can list your event schedules, the price of packages and many other things with this template. This one-page template is one of the most unique and rare ones. 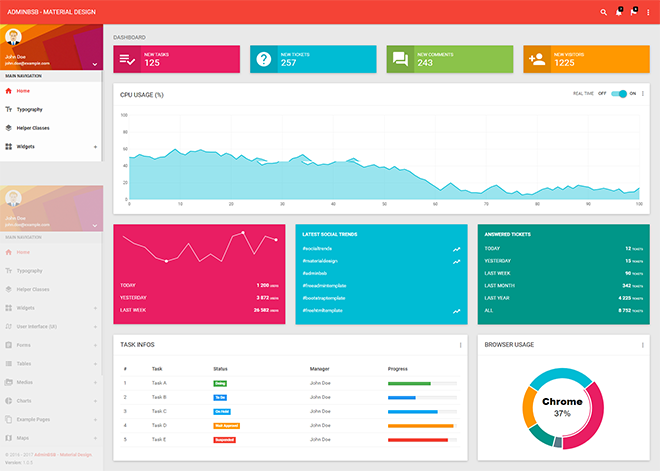 Tabler is a free Bootstrap admin template to control your backend projects. 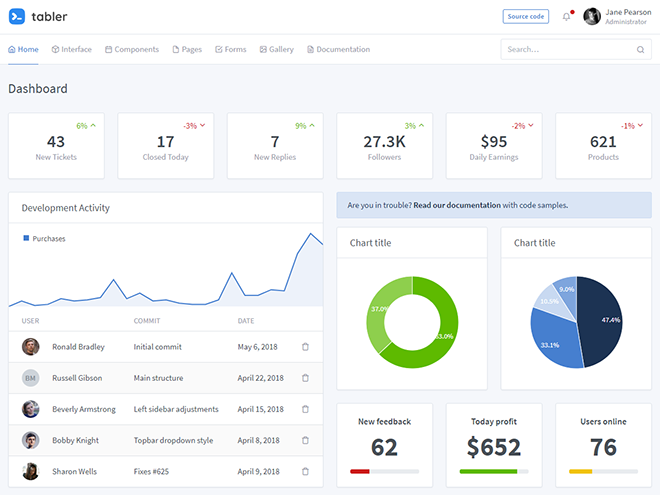 With this template, you can manage and design your admin dashboard as the requirement of your website. Bootstrap cards, form components, Bootstrap badge, table and charts, vector world map, pricing cards, font awesome icons and so many features are included. Moreover, blog section design and e-commerce store are also available. Responsive layout and ready pages make this template more worthy. Among Bootstrap templates 2018, Tabler is a simple and efficient one. 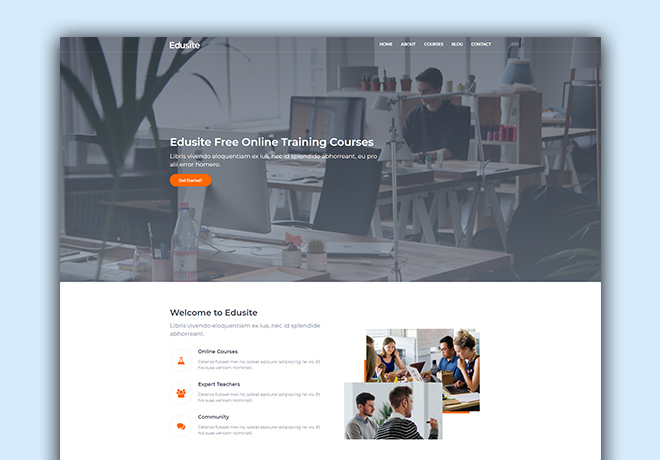 Edusite template is ideal for educational institute, training center or for alike institute’s website. With this free Bootstrap education template, one can build sites for schools, college, university, and similar organizations. Edusite is itself a champ template and provides you premium quality features totally free. It is a multipage and responsive template with pagination facilities. Further font awesome icons, off-canvas navigation, parallax background, buttons, lightbox image gallery, on hover animation and many more features are there. Eventually, a contact form, video section, Google maps are available too. So you can create your desired website and can motivate students as well as normal mass for the facilities you are providing. Among royalty free bootstrap templates, Edusite is the best choice so far. In today’s world peoples are highly aware and conscious about their health. Each and every person maintain health routine. People seek a nutritionist and some do not get time to go physically because of their busy schedules. So doctors and nutritionists must maintain the online website so that people may easily get a primary remedy. 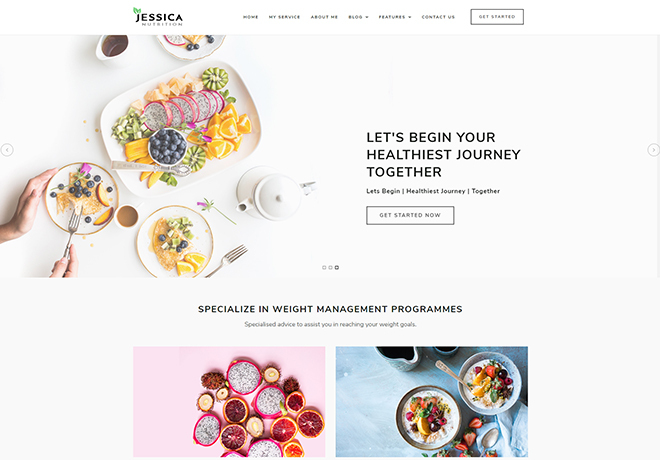 Jessica is the free bootstrap template for nutritionist and dietician. In this template, one will get minimal design facilities. The template is responsive and user-friendly. Manny exciting features like owl carousel, Google font, font awesome icons, ghost buttons etc are included to beauty the website. A style guide is provided for developer’s sake. So customization is easy and one can craft their website according to their need just following the guide. Business is something for which you need to be a mastermind and passionate as well. It’s all about planning extensively so that the business revenue may upward gradually. So if you are taking all proficient steps to maximize the profit then, you must be thinking about online visibility too. In this case, our blog post will effectively help you. 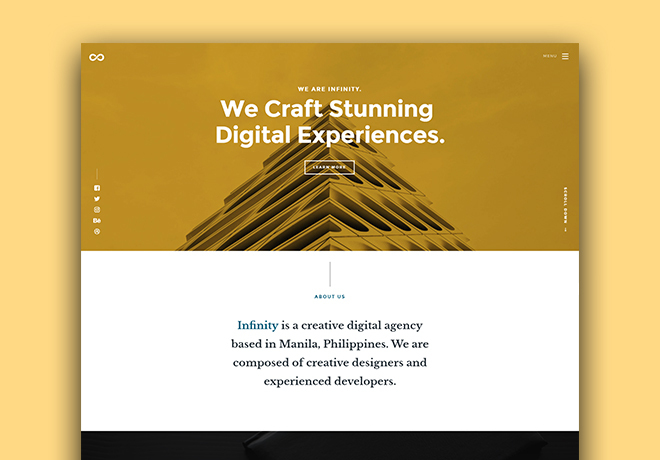 Here we are presenting a free Bootstrap template named Infinity which is suitable for any business and corporate website. Infinity is a supreme template in one word. It is fast as well as responsive and stylish too. Worrying about features? You don’t need to because Infinity provides you bundles of unique features like font awesome icons, parallax header, modal image gallery, flex testimonial slider, back to top button, working contact form, etc. It also offers full customization, well-documented code, cross-browser support. Moreover, its mobile-friendly, easy to use. So you are getting everything you need. Just download it and build your website as you want. Appy is a landing page template which can be used for various purposes like promotional activities, launching new product etc. Landing page templates are always highly demanded and need some unique properties. So we have come with Appy which has all of these. In this template, the moderate UI design, responsive layout, segmented sections, smooth scrolling etc provide the satisfactory user experience. Now let’s talk about features, Appy provides so many features like the navigation bar, hero header, plenty animations, font awesome icons, top-down button, newsletter email subscription box and many others. Some features are designed specially to for you like a call to action button for increasing download rate. Then the testimonial section, pricing section, FAQ section are placed accordingly. So you cant get free such an awesome template. No one can deny the need for a website’s importance in this advanced internet era. Peoples are trying to be more active online to maximize their profit. DUP is such kind of agency template to fulfill all your requirement. 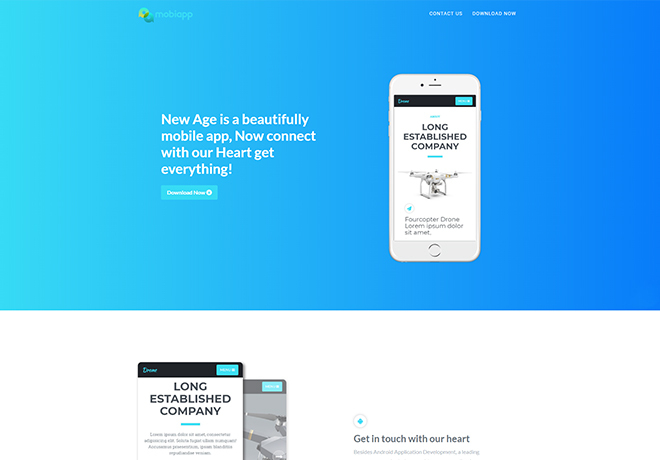 This multi-page template is device responsive. Eye catchy color schemes are added to make an awesome UI. The burger menu will help you to track your location on the website. Magnific pop-up, linear icons, progress bar, owl carousel, big footer menu, e-mail subscription box and many more features are included to provide all the facilities. The codes are also well commented for so that one can customize easily. The flexibility of customization is depended upon you, craft your website as you want. Every individual must have an online identity. And to ensure this configuration, One must have one’s own portfolio website. A portfolio is something which reflects a person’s biography shortly. So in every sector, you must need this. We are suggesting you, download folio and make your own. you won’t get such a nice and sober template like folio. So in folio, there are many more thing to do. And as it is customizable just replace the information and images with the real one. You won’t face many difficulties. This template is responsive so it will fit in every device like mobile, tab, and laptop. Moreover, Hero Header, Sticky Navigation, Animated Text, Filterable Gallery, Ready Blog Page, Contact Form, Social Media Icons, Responsive Design, Carousel Slider and many other things are included. The vigorous color combination of the UI is also eye catchy. With folio make your online portfolio and nourish your dream. Nowadays people of all walk are very fond of fancy foods and because of this, the restaurant business is taking all the limelight. 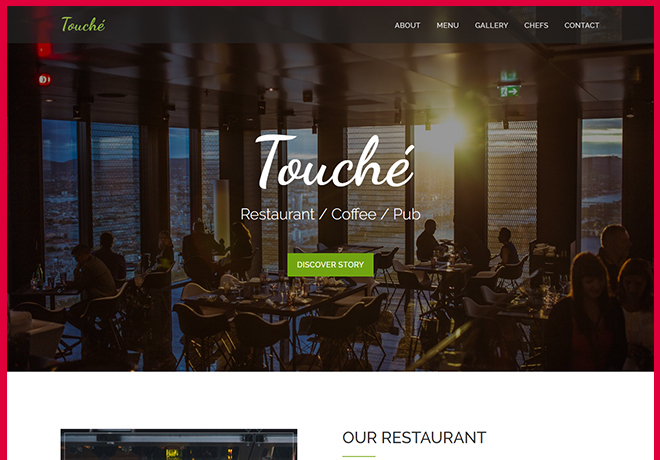 So if you are thinking of starting your own restaurant, cafe or want online visibility for your restaurant then Touche template is the flawless choice for your website in one word. This free Bootstrap template pledges a range of potential features combined with great designer outlook. 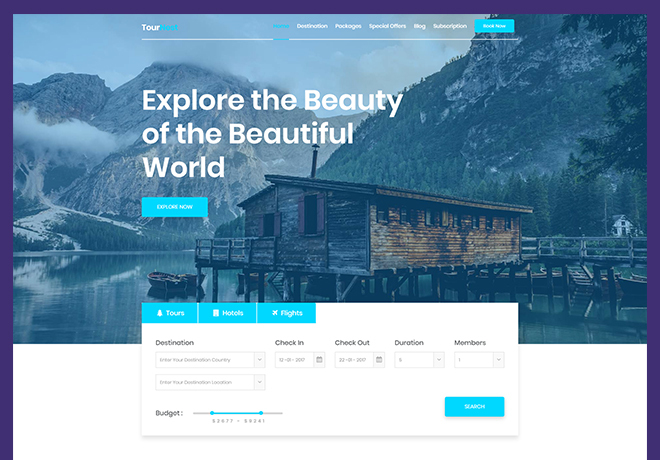 Touche is a free template built up with the bootstrap framework. The Top fixed navigation bar will help to know your position on the website. Then the parallax scrolling and Hero header provide an artistic touch to this Template. The gallery section is one of the most attractive section in this whole template as it is designed with lightbox image gallery module, hover image effects and eye soothing animation effect. Not finished yet, many more features like contact form, social media icon, sortable gallery etc. So design your restaurant website and earn more. Large business companies maintain a website for good management. Those companies which need to maintain huge data set must have an admin panel. Admin panel is one of the important parts of any website which keeps that website alive. Not only this it also takes care various issues like the performance of website, traffic and many other things. So if you need an efficient and workable admin panel and dashboard template you can take Admin BSB. It is undoubtedly a worthy one among free Bootstrap admin templates. Menu chart set, collapsible navbar, multilevel menu, 3 types of map, card widgets, carousel image gallery, form elements, label style and many other features are there. Not finished here, you will get more like various tables, charts, forms, alerts, buttons, list groups and so on. This template provides all necessary features which one may need to craft admin panel website. Besides, well-documented codes are there available for developers. So it is worthy as well as a superior template. Grab it and enjoy the advantages cost-free. Traveling enchant people from the ancient age. To overcome the monotony of life people travel for refreshment. Today to help peoples in this case, there are many travel agencies and tour guide companies are there. They try to make things easy and comfortable for traveler so that they can enjoy the fullest. These agencies are doing well too. So if you own a tour agency, then you must have a website otherwise clients may find it difficult to find and contact you. Tournest is a marvelous template for these companies. Everything is done via internet today so just having a nice company or agency is not enough today, you need to be strategic too. So having a website is a must today. 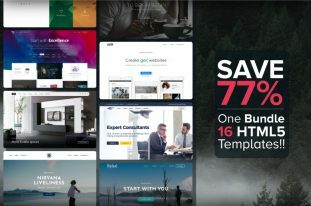 We have arranged this list of Bootstrap templates 2018 which gives you several highly admirable templates. You can design your website totally cost-free with Tournest. It is one of the finest templates you have gone through. It a bootstrap framework template which is fully responsive. The sticky navigation bar, countdown counter, testimonial section, pricing section, email subscription form, social media icons, full-screen header image and many other features are available. Moreover, three types of booking form are also included. So you see, this template is actually worthy enough for tour agency website. The recent business world is highly competitive and everyone is running towards success. Being turtle you can’t win the race anymore because you need to be steady and fast both. To cope up with this highly challenging business field, online activities are also important. No matter small or large business you must have a website to retain online business. For this purpose sight is ideal. It is one page and upgraded template equipped with the bootstrap framework. Here you are getting many amazing options and features to manage your business website. Like full-screen header, smooth animation, sticky header, Google front, responsive layout etc. stylish UI, fully customizable and well-documented code are added extra benefit. So Sight can be really useful for any business or agency website. 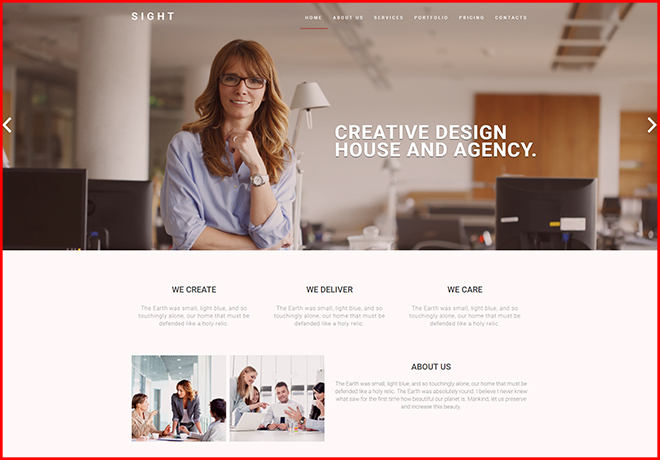 From the collection of free Bootstrap templates, download Sight for better development. 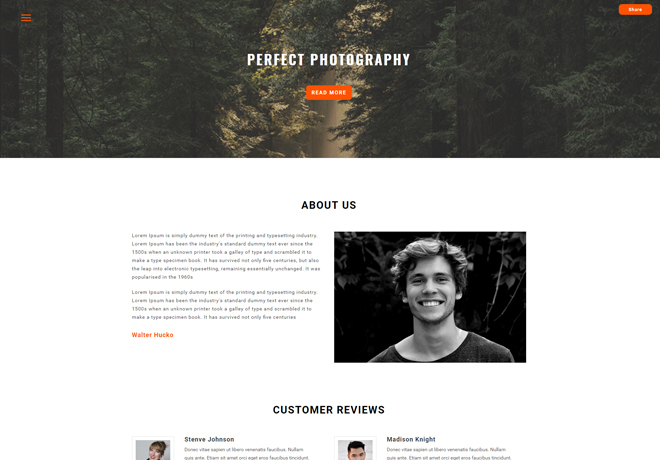 Snappy is a free bootstrap multipage photography template. You want to use Snappy for which type of photographic purpose like wildlife, wedding, portrait etc it’s upon you. But if you choose to use Snappy for whatever photographic purpose, it won’t make you disappointed. And as a photographer, if being digitalized and online activities are your crying need then snappy is just for you. As it is SEO friendly, it will help to manage your online website performance and traffic. The design of this template is so moderate that it will obviously feed the hunger of your eyes. The design is nice, clean and smooth. Besides the responsiveness of this template is amazing. It just fits easily with any type of device. Features like animated preloader, on hover animation, Instagram feed, magnific pop, font awesome icons, sharing icons with animations, contact form design, cross-browser compatibility and many other facilities are included. The codes are well commented and documented. So it’s easy for developers to customize and design as they need. So hurry and use this template and share your experience with us. 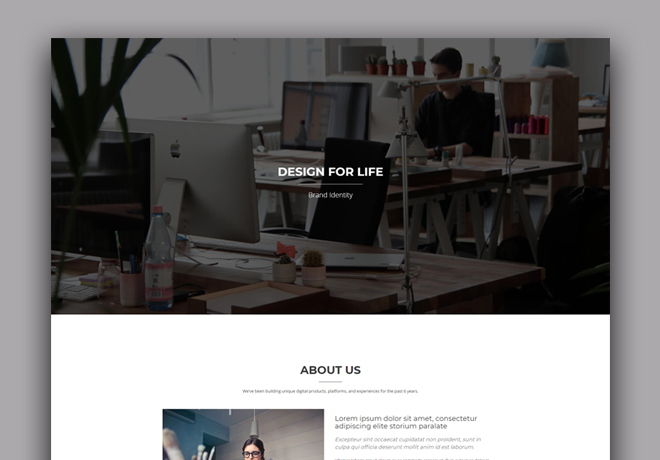 Alstar itself a hero template for a business agency or portfolio website. It will help you to design your website so accurately that you cant stop falling for it. This template is beautifully organized one. So if you want to use it for business purpose, it will definitely help to seek client attention and to socialize. And it is the most effective business strategy. For a portfolio, this template fits also. Alstar is one-page template specially designed for freelancer, creative agency, developers. It features responsive layout and amazing user experience. The attractive design layout, smooth scrolling, cross-browser compatibility make it more than awesome. Not only this many more features like hero header, sticky navigation bar, distinct sections, carousel slider, on scroll animation, font awesome icons, gallery and so on. So Alstar is free but possesses all premium qualities which you don’t always get. And, it makes its stance among free responsive Bootstrap themes. Kards is mainly portfolio and personal website template. You can use it for personal vCard website. Making vCard using Kards template you will be one step ahead of your competitors. 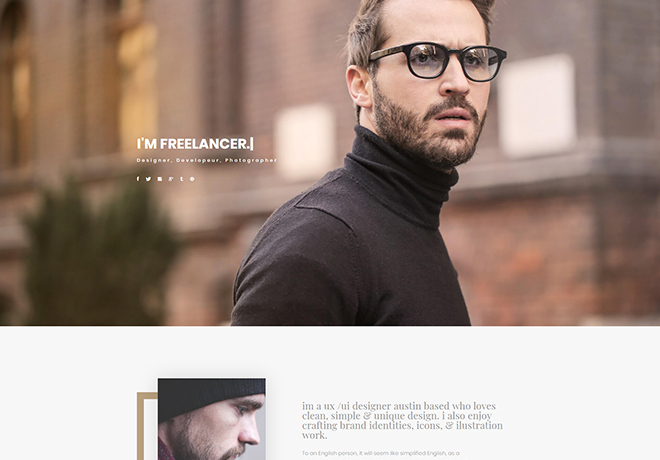 This free Bootstrap template is unique and retina ready. For this qualities, it provides frangible and color radiant UI. And it is also attractive and the nice designed layout is user-friendly too. You can put all your information in a well-arranged manner in segmented sections. So it will be easy for clients to find you and your information. Moreover, this templates has a blast of unique features. Like icon fronts, owl carousel, major browser compatibility, font face custom web fonts, timeline items, portfolio section, star section, skill bar and so on. And working Ajax form and Front-end form validation is also added. A developer can customize it easily according to their flexibility. Don’t miss it. Kards is such a template in free Bootstrap templates which you will always admire to have. If you don’t have any coding skill but you need to have a portfolio website and maintain it as well then Minimus is the perfect choice for you. It is a readymade marvelous free Bootstrap template which needs minimum customization. Just download it, replace the demo data and images with real ones and have fun. Moreover, it is free so you won’t face any loss. Its crumble layout and vibrant color combination layout is beyond attractive. It offers varieties of features like burger menu, progress bar, font awesome icons, dynamic text display, image popup, sticky header, masonry, animated social media icon etc. Contact form UI is also there. All elements are featured nicely to deliver you an elegant website. Free Bootstrap templates are for the people who want to kickstart with a minimal resource. And Minmus supports your journey from the beginning. Creativity is a gift which everyone should nourish properly. Your creative thoughts, ideas should be disclosed and showed to the world. For this purpose, you must need an online site. If you are searching for such type of template at a lower cost, then we will suggest you choose Rea which is absolutely free. 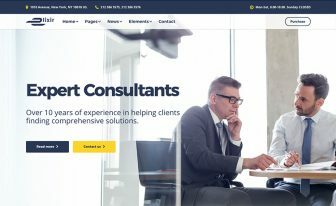 This free Bootstrap template is designed specially keeping in mind that your unique and intelligent ideas may bloom properly through the website. And its UI is so attractive, nice and clean that visitors would feel comfort roaming around the website. So it will both satisfy you and your visitors or clients. 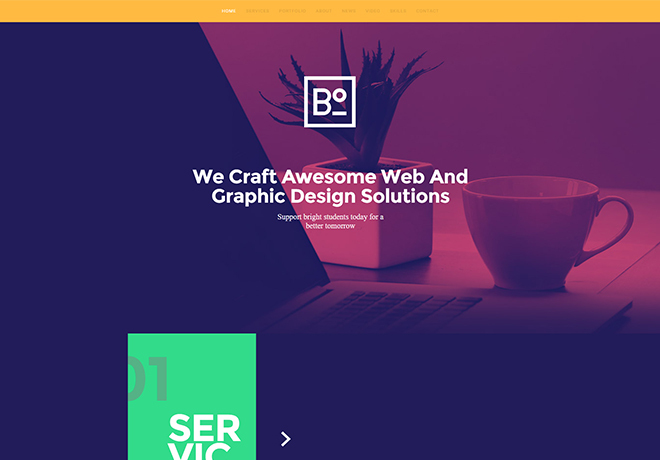 In this Bootstrap theme, you will get a numerous number of features like the hamburger navigation bar, on-hover images, typewriter effect, animation, contact form etc. In the featured section you can add cool videos too. Be creative, showcase your creativity and grab attention with Rea. Among free Bootstrap templates, Rea is the most creative one to count on. Multipurpose templates are more useful ones because you can use this templates whatever purpose you have. And you don’t need to search for particular type, just download a multipurpose template and start building your website. So these free Bootstrap templates are highly demanding for multiple uses. 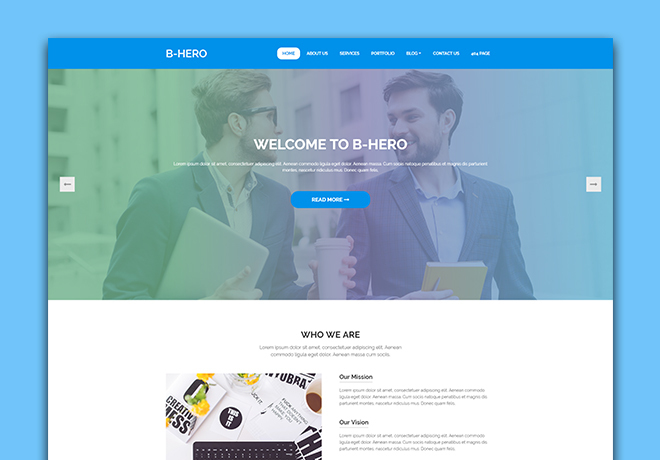 Here in this blog post, we have enlisted B-hero which is an extraordinary Bootstrap multipurpose template specially made for business and agency. This template is feasible to customize and flexible too. 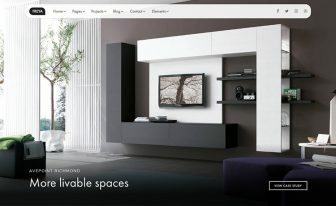 A featured slider is included which adds more beauty to the design. Font awesome icons, animated counter, parallax effect, pricing table, Google web front, working contact form, social media icons and many more features are available. Blog and slider client testimonial sections are also featured here. 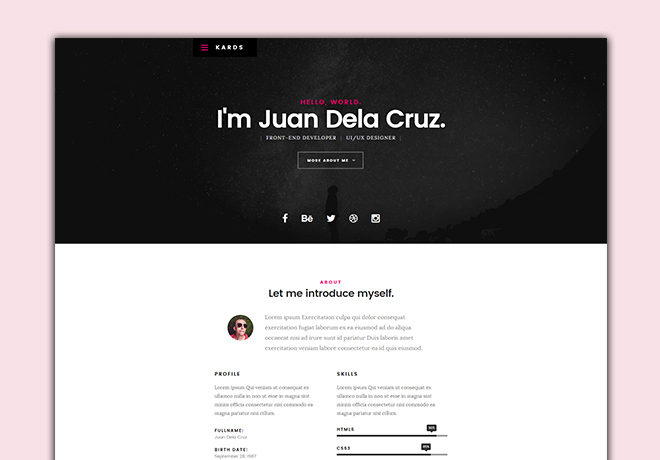 So you can build your business, agency, start-up and whatever website you need with this multipurpose template. Raising template is designed for construction firm, architectural industry, civil engineering firm or companies like this. All the construction firms should maintain a well-constructed website so that client may easily reach them and contact them. So for your construction firm Raising is the proper choice. 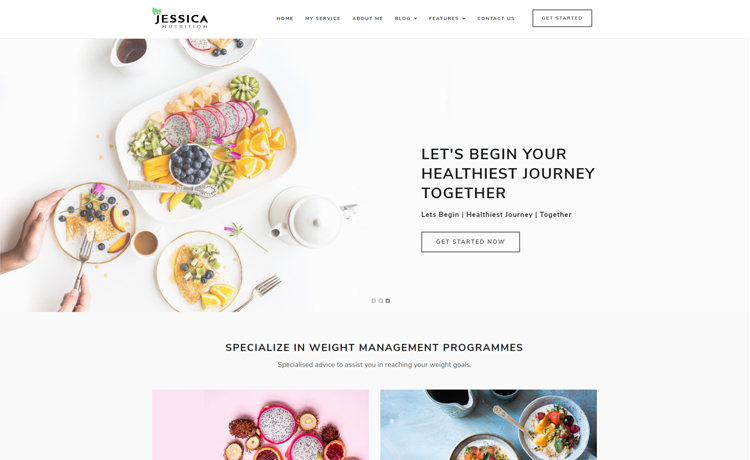 Using this free HTML5 template you can have a superior website where all the information, projects, assignments, designs and works can be maintained properly. The navigation bar, swiper slider, on hover animation, magnific pop-up, isotope-masonry layout, integrated Google Maps, search bar, smooth scrolling, off-screen menu, responsiveness and many other features are included. Separate contact form available. With this template, you can show your current projects as well as older ones. So all you need to craft your website is provided here, just download it and make proper customization to build own website. 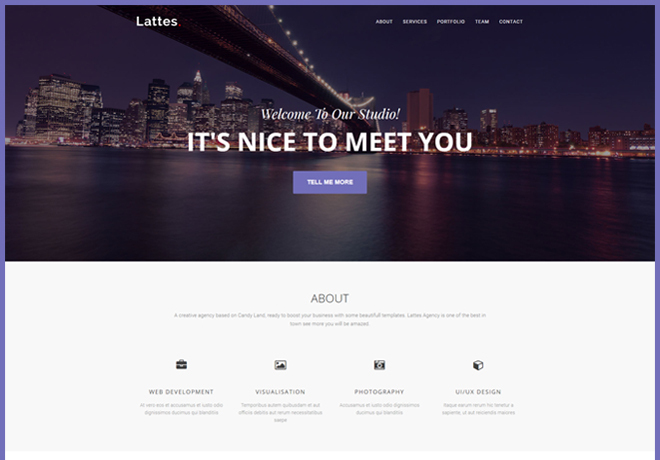 Lattes is a multipurpose template feature all necessary elements. It is eligible for all type of business website. Its neat and clean design layout and mesmerizing UI will open your jaw. The UI is also classy and attractive. In this template, you will find many white spaces which are kept intentionally to focus on your content intensely. A counter is also added so that visitors may easily take a glance at your award, client, team and project. Then a full-width background with hero header beautifies the UI. It comes with sticky navigation bar through which you can track your location on the website. Font awesome icons, image gallery, on hover effect, contact form, top-down button etc features are available. Sevice, portfolio, team sections are separately arranged. 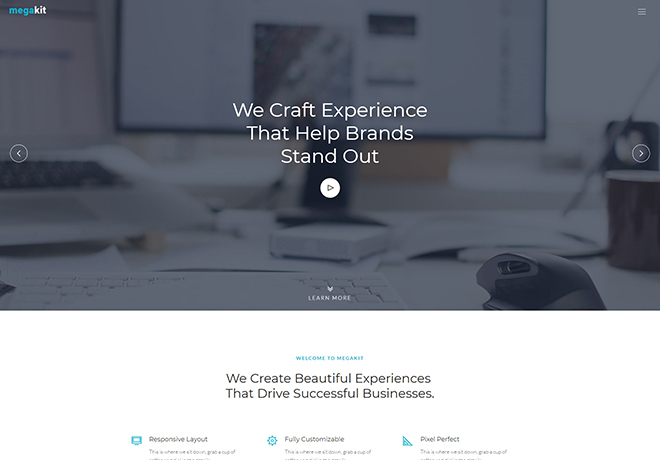 This template is super responsive to all device and also user-friendly. Codes are well documented for the developers so that they can customize it easily. So you see Lattes offers you uncountable advantages. Don’t think too much just download it and share your experience with us. It is a one-page site template. You can use Maxim for freelancing, agency or portfolio purposes. This template is a significant one among free Bootstrap templates. 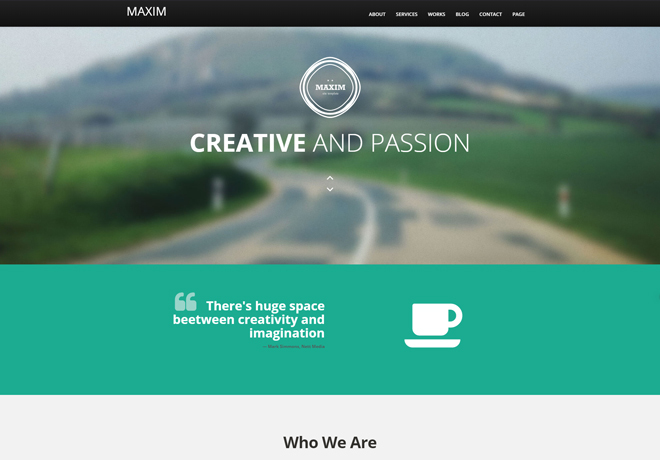 You can also showcase your creative ideas through Maxim. In this template, you will see the blast of colors which are perfectly combined to beautify the UI. The structural design layout is amazing looking and perfectly responsive to all devices. The full-width background is laid with slider text. Then there is navigation bar which is sticky. Sortable image gallery, separate sections, smooth scrolling, contact form and many other features are available. Further, there is distinct service, work, blog, contact sections. It is built following the latest trend so download this theme and keep updated. Awesome list of free bootstrap templates that transform your site to next level. All the templates look so nice. Keep it up for more list.